It is a pleasure to join you this morning for the launch of Global Entrepreneurship Week 2017. 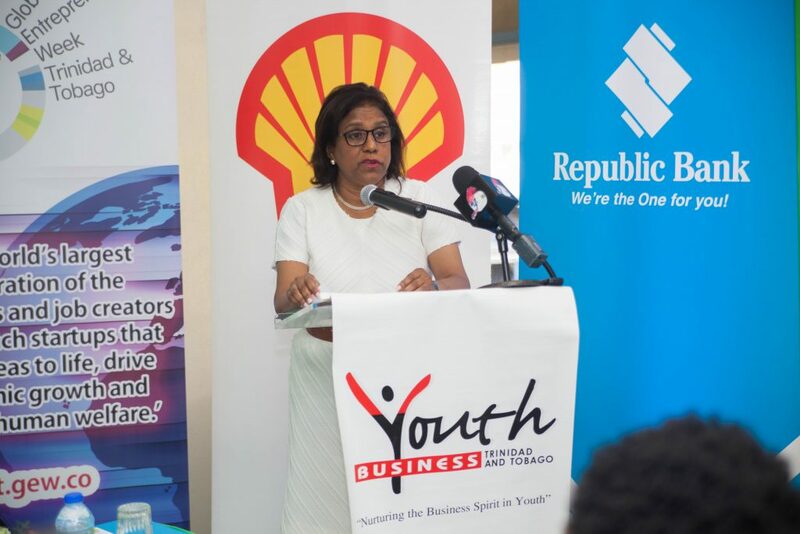 From our perspective at the Ministry of Trade and Industry, this is a very exciting event and period for entrepreneurs, particularly the young entrepreneurs, in Trinidad and Tobago. The Minister of Finance, earlier this month, identified several areas that the Government is focused on to diversify the economy, promote import substitution and grow exports – areas such as manufacturing, agriculture, tourism including sports tourism, information and communication technology and construction. There are opportunities for both seasoned and emerging entrepreneurs as the current environment challenges us all to think away from the usual. This also mandates the application of both innovation and creativity – two cornerstones in the foundation of any successful business. As we commemorate Global Entrepreneurship Week, we must recognize the important role which small and medium-sized businesses play in the domestic economy. Data from the Ministry of Labour and Small Enterprise Development indicate that the MSME sector is comprised of over 20,000 companies, representing more than 85% of all registered businesses and contributing approximately twenty-eight percent (28%) of GDP. The most significant economic activities in this sector are Retail and Distribution, Personal Services, Finance, Insurance, Real Estate and Business Services, and Construction. The entrepreneurial spirit in the non-energy sector is pivotal to our nation’s economic development. Historically, many of our entrepreneurs have successfully overcome myriad hurdles and through their innovativeness, commitment to excellence, and tenacity, have changed the business landscape locally, regionally and in some instances globally. Trinidad and Tobago is replete with exceptional entrepreneurial talents including local business chamber inductees Helen Bhagwansingh, Arthur Lok Jack and Robert Bermudez, now Chancellor of The University of the West Indies, as well as creative entrepreneurs such as Bunji Garlin, Claudia Pegus and Danielle Diffenthaller. They exhibit key traits of successful entrepreneurs – passion, self-discipline, motivation, flexibility, a keen eye to exploit an opportunity, a propensity to take risks, self-confidence; and importantly, perseverance in the face of obstacles; and coming from a business family I understand this. We should bear in mind Richard Branson’s advice that “failure is one of the secrets to success…” In naming the older generation, it will be remiss of me if I did not bring to your attention some of the younger but already successful young entrepreneurs. Oliver Sabga – who is just about 30 years old of Term Finance, a web-based company which started in Trinidad and has now extended to Guyana, St. Lucia, Barbados and Jamaica. Mr Aldewyn Wayne – WI Pay, a payment platform already shared by several merchants including Massy Stores. Cocoa Republic – a locally produced chocolate company started by two very young chocolatiers. The entrepreneurial journey is unique, requiring distinctive skills. The presenters this morning have described experiences and issues faced by our entrepreneurs and innovators as they seek to carve out a niche for themselves. I am encouraged that strides continue to be made by both the private and public sector in support of the business community in the existing global economic climate. The National Development Strategy for Trinidad and Tobago for 2016-2030 (Vision 2030) identifies the need to “create a culture and climate for entrepreneurship and innovation towards creating the economy of tomorrow”. The Government has thus adopted a multipronged approach to achieve the objectives of the National Development Strategy including support for a culture of research and development. Vision 2030 also emphasizes the necessity of the private sector harnessing such activities to enhance growth and competitiveness. If we are to increase our competitiveness, product and process integrity, quality and excellence are paramount. To this end, the Government has developed a National Innovation Policy which has recently received Cabinet’s approval. Implementation of this Policy will create an environment that will position Trinidad and Tobago among the leading knowledge and skills-based countries in this hemisphere. This is all the more necessary with the advent of the Fourth Industrial Revolution, the rise of artificial intelligence, and augmented reality and the ubiquitous technological impact of the Internet of Things. Research is a critical component of this innovation enabling environment required for entrepreneurship. Cognisant of this, and as a means of increasing the role and application of research and innovation in business, the Ministry is re-engineering its existing Research and Development Facility (RDF). The revised facility will be attracted to manufacturing and services and will span the phases of technical and commercial facilities, product and service development and the actual commercialisation, ensuring in particular that the product or service can get out to the export market. In addition, the current comprehensive suite of incentives including fiscal incentives, import concessions, manufacturing allowances, tax exemptions in manufacturing, creative, maritime and other sectors serve to enable enterprise and to encourage enterprise for innovation. We know that access to capital is the biggest. Several of the global indicators have placed our country on the lower end of this scale. In particular, the gap is wider for the newer and “different” entrepreneurs and small and medium-sized businesses. Only 11% of startup funding has been accessed through formal financial institutions. I am really heartened by what Republic Bank has indicated today and I hope other financial institutions build on the idea. But, as a Government, we are addressing this in several ways. A new business development fund in the amount of $50 million TT will provide for working capital and/ or seed capital through grant funding –up to $100,000. A $25 million Grant Fund facility for small and medium-sized businesses already established and engaged in processing and manufacturing – $250,000 per business. The MTI has also been working towards the establishment of a collateral registry and secured transactions regime which will allow for the use of movable property as security – increased financing for entrepreneurs. Agricultural support financial programme: $100,000 grant for new and existing farmers. Several opportunities within the tourism sector. The Government is reforming the enabling environment to facilitate entrepreneurship and innovation, and also investing in new economic infrastructure for innovators. Those requiring infrastructure can, therefore, obtain land lots, with all utilities, at the Tamana InTech Park in Wallerfield which caters for businesses in ICT, Business Process Outsourcing, Data Processing Centres, Animation and Software Development, High-Value Manufacturing and Financial Services. An Agro-Processing and Light Industrial Park in Moruga is scheduled to come on stream in 2019 with land and some factory buildings. A similar project is also planned for Phoenix Park and will commence in 2018. The Government, together with key partners, continues to make a concerted effort to create a favourable environment for entrepreneurs and enterprises. This includes positively impacting current business conditions and improving the quality and speed of service delivery by the Public Sector through projects aimed at enhancing the ease of doing business. It was Mark DiMassimo (a global entrepreneur ) who said that “The internet remains a place where you can start with nothing and soon challenge the gods.” In order to facilitate the expansion of entrepreneurship, the MTI has been developing a National e-Commerce Strategy which seeks to facilitate and promote e-commerce for local businesses that are serving, or intend to serve, domestic and/or international consumer markets.  collaborating with the Inter-American Development Bank (IDB) and similar organisations to encourage more firms to have a full online presence on ConnectAmericas (large and free) and other similar platforms. The MTI, as a facilitator, continues to implement mechanisms to embolden local businesses recognising that entrepreneurship is indeed a game changer. New business activity truly does support and stimulate economic diversification which is now an imperative. In maintaining this focus, the activities hosted in commemoration of Global Entrepreneurship Week 2017 by YBTT will enhance the visibility of local business development activities, the promotion of enterprise and self-employment, and also stimulate further entrepreneurial activity by connecting collaborators, mentors and investors and creating opportunities. Let me urge you all to build on these connections as a very robust network will be integral to your future success. The Ministry of Trade and Industry is pleased to participate in today’s commemoration as part of a global movement which supports and enables entrepreneurship we are fully aware that it is an important source of value creation and growth. As an Administration, we remain committed to supporting any effort which maximises opportunity, enhances entrepreneurship and, promotes exports. As enablers, ladies and gentlemen, you are encouraged to step out into the unknown, build and expand your networks, educate, innovate and build your businesses to not only serve the domestic market but regional and international consumers. You are encouraged to be part of this landscape if even you have to keep remodeling and reinventing yourself. I therefore challenge you to distinguish yourselves, excel, create and innovate; venture into new markets, enhance your businesses, embrace both challenges and opportunities as these are transformative and will only prepare you for success.